I got these flowers from my boyfriend (yeah, he's a keeper), for my birthday (which was on Sunday [yeah, I'm a groundhog]), and they have been the perfect thing to deal with the groundhog's prediction of six more weeks of winter! In fact, I'm on such a flower kick that I just ordered The Flower Recipe Book with an amazon.com gift card! I read about it this past summer and have been lusting after it ever since... If you haven't heard about the book, you really should go take a look! The flowers and photography are just beautiful! Anyways, I hope you all had a great weekend! I had the best birthday weekend with Nehill and my parents! We didn't have any special plans, but when you're with the right people anything feels special! Hope you all have a special day my friends! 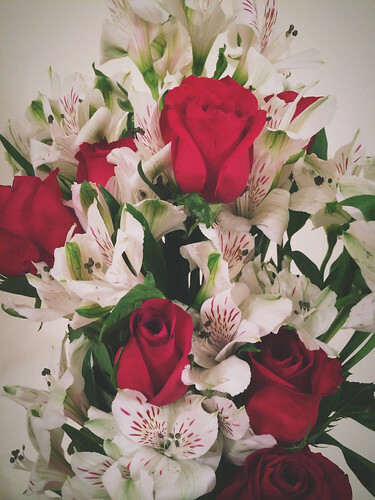 What wonderful flowers from your boyfriend and it sounds as if your birthday celebrations filled you with joy! Now I'll go and have a look at that Flower Recipe book! P.S. Is the groundhog always right about winter?! buon compleanno Kate!!!!! beautiful flowers for a great girl!!!!! Happy belated birthday :-) So glad it was a good one for you.